Record Store Day items are listed at the top of this update and the normal update items follow. Know that many of these items are extremely limited and were split between thousands of stores so our quantities are proportionately limited as well. There are things we got blanked on and some things that perhaps will arrive late next week (we’ll post about those as they come). If you are looking for a specific item that we have listed it is advisable to get here very early. 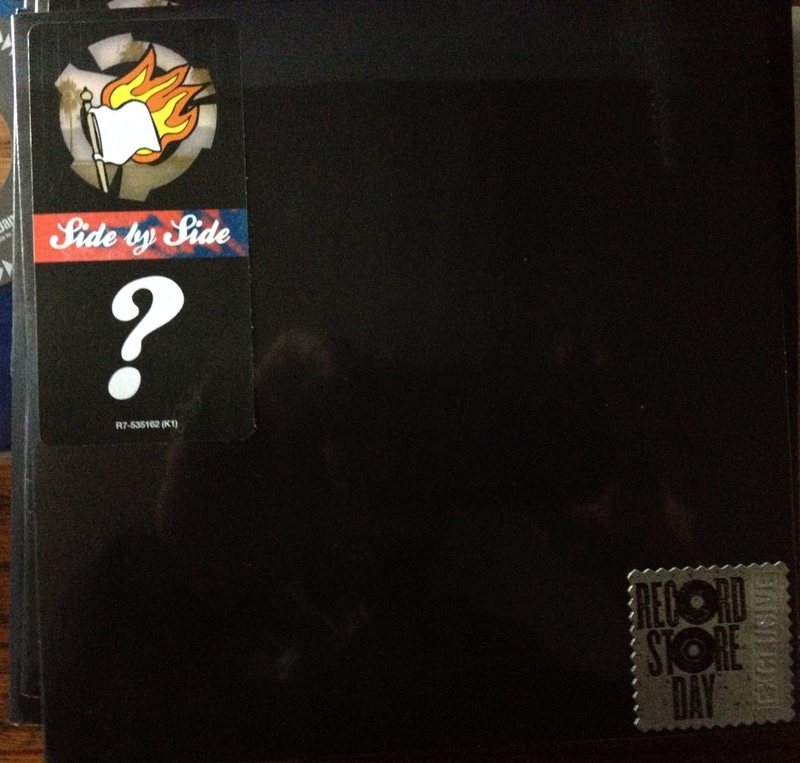 As ever here, RSD items will be first come first serve and one of each title per person. It is looking like it might rain so please take care of yourself as well – rain gear in tow. The line will still be outside rain or shine (we are a small shop still). The food trucks will still be coming too (approximately 9AM-1PM for those). We expect everyone to be cordial and respectful as well. No holding spots in line/no cuts. Be excellent to each other. We’ll have some friends from the Hartford Area Roller Derby helping us keep things going smoothly inside and out. We love seeing so many friendly faces in one day and we’re looking forward to a great time. T.S.O.L. “You Don’t Have To Die” E.P. Thanks for reading. Looking forward to Record Store Day tomorrow! And remember: be excellent to each other. Cult, Foreign, Criterion, Horror and T.V. Show DVDs. As of today, all new Cult, Horror, Criterion, Foreign, and Television DVDs are on sale. Take 25% off over 400 great titles! We need to clear some room! Help us clear some shelf space while expanding your film library! Some of these are out of print and very hard to find! Here’s 6 randomly selected DVDs from our selection: Desert Punk (series), School House Rock!, Suburbia (Roger Corman), Manson Family (Unedited Version), Virgin Witch and Street Trash. Come in and take advantage of this while it lasts. As soon as we have enough room we will be ending it. Tell your friends. 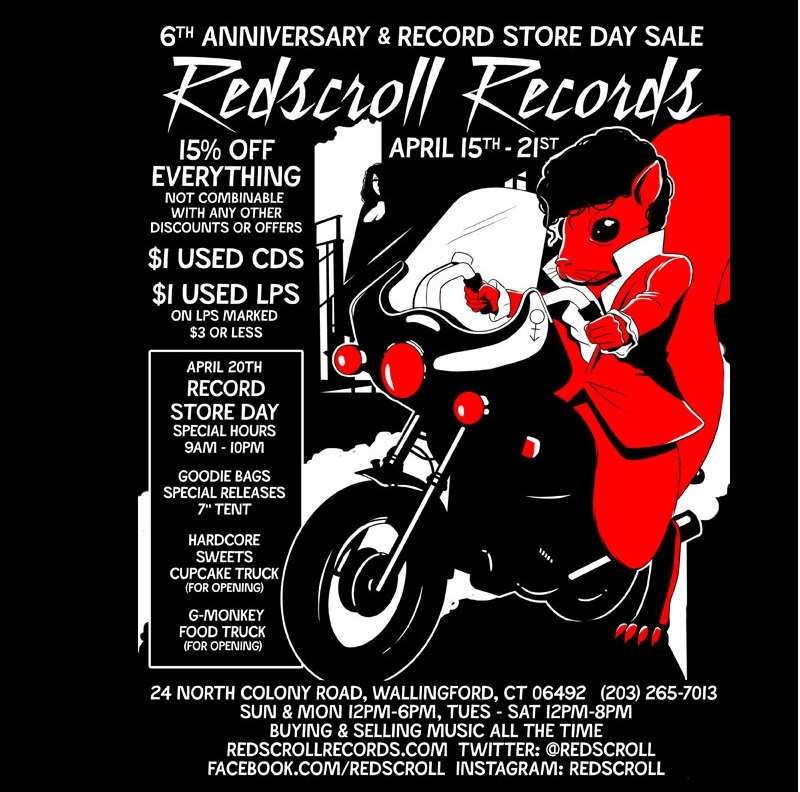 Redscroll Records is always buying used vinyl, CDs, DVDs, and books of interest! We pay cash, but we’ll give you a bit more in store credit. 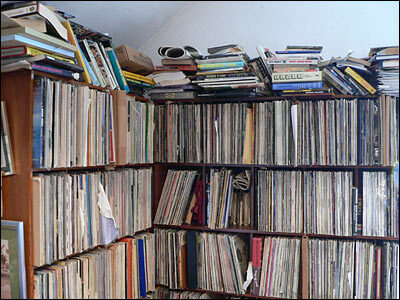 Now that we’ve rearranged the store and opened up a whole new room for just used records we have a wealth of space. We’ve all got stuff on our shelves that we bought checked out once, and will never pick up again. I’m talking about things that you have no sentimental attachment to. Maybe you have a family member who is just holding onto things because they don’t want to spend the time to get rid of them – offer your time to come to our store with that uncle’s 70s rock collection, mom’s old Aleister Crowley books, your cousin’s ska CDs, … Spring is traditionally the time for cleaning so why not go through your collection and weed out anything you haven’t listened to in a couple years? Why not? I will tell you why you should. It is beneficial for us, but it is also beneficial for you. Tag Sales, Craigslist, Ebay, … all those things take up a lot of your time. Time is money, right? We will pay you on the spot. Spin yarn into gold. One man’s trash is another man’s treasure (gender neutral usage). When you go to a record store with a great used section it is because of a few factors. Perhaps, the purveyors of said store found a magic beanstalk which they climbed and defeated a giant who had a great collection of discs (that were probably tiny to him). More likely is that they’ve built a niche within the community. They’ve sold and bought records to people with respectable tastes. We have a respect for the people that come into our store and that is why we are writing this now. Sell us your used media so that another may easily find it. We all win!